When Kirit Densira left her home tower for the skies, she gave up many things: her beloved family, her known way of life, her dreams of flying as a trader for her tower, her dreams. Kirit set her City upside down, and fomented a massive rebellion at the Spire, to the good of the towers–but months later, everything has fallen to pieces. With the Towers in disarray, without a governing body or any defense against the dangers lurking in the clouds, daily life is full of terror and strife. Nat, Kirit’s wing-brother, sets out to be a hero in his own way–sitting on the new Council to cast votes protecting Tower-born, and exploring lower tiers to find more materials to repair the struggling City. 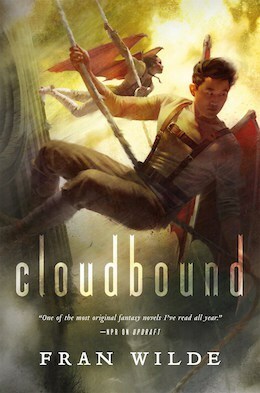 But what he finds down-tier is more secrets–and now Nat will have to decide who to trust, and how to trust himself without losing those he holds most dear, before a dangerous myth raises a surprisingly realistic threat to the crippled City, in Cloudbound. 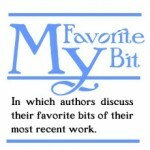 When people ask me about my debut novel, Updraft, their questions usually center around worldbuilding or influences. Online, there’s a lot of speculation about what’s down below the clouds. (I promise, you’ll find that out with Cloudbound, out September 27, 2016 from Tor — hey, that’s today!). We talk about monsters a lot too, and man-made wings, multigenerationality, and occasionally about echolocation. What I don’t get asked about a lot is the disabilities represented in the series. There are three characters in Updraft with physical and/or neurological disabilities, as well as others with additional fall- and battle-related injuries throughout the book. Moreover, there are no magic cures – characters who get injured deal with the repercussions of those injuries throughout the series. How various communities treat each of these characters is part of Updraft’s world. But each of these characters also has their own story arc and agency within the Bone Universe. As one mostly spoiler-free example, Elna Densira has altitude and cataract-related skyblindness. She is a force in the book, as well as in Cloudbound. When we first meet her, she’s climbing a ladder to the top of her tower with Nat close behind. She still gets around well, she works to support her family, she’s capable — an excellent seamstress — and she interacts with the other characters about things other than her vision impairment. So it goes mostly unmarked. With other characters, disability is a consequence of living and fighting at high altitude, and if the injury does interfere with intra-character communication, part of the story is the importance of finding ways to listen and hear those characters, on their own terms. Disability in Updraft and Cloudbound isn’t a checkbox or a layer added in order to make a character more sympathetic or anything else. We like to put characters in boxes sometimes, and, when added as a layer to create some problem for the narrative or character, disability can become a literary box that a reader can’t see past. That occasionally happens in real life too — when only a person’s disability and not their competences, their excellences, their passions, are how they are perceived. Earlier this year, I fell and did some damage to an old injury that had me flat on my back for days. In frustration, I cut loose on Twitter, admitting something I’ve been keeping mostly to myself for years: I live with pain — not just the migraines, which most people know about — but regular, pretty extreme pain. I’d written about some of the external stuff (like identifying more with Helva from The Ship Who Sang than with Deenie) now and then, and about various braces, but I’d kept quiet about the rest. Afterward I met so many people who deal with similar issues and making those connections helped me see truths about my experience — especially some parts of me that I hated, because I’d written my sensitivity to pain off as proof that I was weak and not good enough. pfffft. What happened after sharing that information, though, was a bit more troubling. People occasionally began to introduce me as having chronic pain, without my permission. One indicated that they hadn’t invited me to do something because they were worried about my pain impacting my ability to do it, and hadn’t wanted me to feel awkward. That was annoying, because the only thing that had changed for me was that I was public about something I’ve been dealing with, without letting people down, for decades. I like to make my own decisions about what I’m able to do — everyone does. And if that happened to me from one twitter rant (plus a couple blog posts in the way-back-when), imagine then how people with visible disabilities are treated every day. As a culture, we like to put people into boxes, constraining them to labels, instead of seeing them for who they are. At this year’s Worldcon, I was on a panel called “Unlikely Heroes.” A lot of great discussion happened there, but one thing was said — I can’t remember by whom — about how if you wanted to create an unlikely hero, you could give the character a disability, as if that would somehow render them less likely to be heroic. I disagreed vehemently then, and the conversation moved along. (The moderator was excellent and this was not her fault.) But as the weekend wore on, and then the months after, I kept coming back to this issue of disability defining characters, instead of disability being a component of a character’s life, with their character, backstory, competencies, and goals being dominant and primary. It’s something I think I’ve always consciously written against and will continue to do. When it came to writing Cloudbound, I’d selected a character from an earlier story set a decade earlier in the Bone Universe, called “A Moment of Gravity Circumscribed.” In that story, a young character, Djonn, is viewed as clumsy by his family — and he is, but not for the reasons they think. Djonn’s in the very early stages of a skeletal degeneration that translates to extreme late-onset idiopathic scoliosis. This curvature of the spine is something I share with my character (and something that affects, to varying levels, about 2-3% of the United States population). As a kid, my curves (there’s either one or two – I got the double) were pretty extreme, and I wore an experimental brace that caused more damage than expected. Even now, I’m not straight, though it’s hard to see. As an adult, this results in pain, overcompensation, and sometimes joint slips that cause additional pain. For Djonn, there are no real treatments. Left untreated, spinal curves can sometimes go past 70 degrees (think King Richard III), and that’s what’s happening to him. Such curves would make flying (which requires a pretty straight body plane) progressively harder, and even breathing sometimes very difficult. Djonn’s an inventor and artifex, so he’s created his own solutions for this over time. But his backstory and his role in Cloudbound are much more about the rest of his life — the things he’s invented and his interactions with other characters — than about his physical disability. Djonn is extremely good at what he does. Djonn’s limitations and imperfections are part of the story too. But he’s in no way an unlikely anything. Nor is he a hero through and through. He’s a complex character. So I guess what I’m saying is that one of my favorite bits about both Updraft and Cloudbound is that the disabilities (and hey, not just one flagship disability because no) in this narrative are represented by full-fledged characters first and foremost. So much so, in fact, that those disabilities have gone mostly unremarked in later discussion. Thank you for what you said about “unlikely heroes.” I haven’t seen it put that way before, and you’re quite right. And I’m partway into CLOUDBOUND and loving it. Elise – thank you! I would love to hear your thoughts anytime – and thank you for loving CLOUDBOUND! I had left this post open in a tab on my browser for several days because I wanted to read, and not just skim, the content. Good decision. Cloudbound is sitting on my Nook awaiting my attention. I was particularly impressed with the many facets of the characters in Updraft and can’t wait to delve into Cloudbound. Fran’s additional insight only deepens my interest.